Newton was born on December 25, 1642, in Woolsthorpe, England. His father died shortly before his birth and left the family with few resources. His mother remarried when Newton was three, and he was sent to live with his grandparents and later with a family named Clark. In the Clark’s tool shop his genius for mechanical devices and toys began to emerge. At age 18 Newton enrolled in Trinity College at Cambridge, where he excelled in mathematics. Four years later, in 1665, an outbreak of bubonic plague closed the university, and he was sent home. During this time, he formulated the binomial theorem in algebra and developed the calculus (also established independently by GOTTFREID LEIBNIZ in 1675). He also discovered that white light is a mixture of pure colors and explored ways to project and reflect images in telescopes. Newton later told a story that he was sitting in an apple orchard, pondering what keeps planets in their orbits, when an apple fell near him. In a flash he saw that the same force that pulls the apple to the ground also pulls the moon to Earth (but the moons sideways speed is great enough to keep it from hitting Earth). He told no one about his discovery for nearly 20 years. Newton returned to Trinity for a fellowship in 1667. He developed a reflecting telescope in 1668 and was appointed to a professorship at Trinity College in 1669. His last series of lectures explained his work on the nature of light and optics. Newton cautiously made his work public through the Royal Society of London starting in 1672. The papers he delivered there soon led to controversy between Newton and scientist ROBERT HOOKE, who contended that Newton used his ideas without credit. Newton bitterly withdrew and suffered a nearly complete breakdown in 1679, following the death of his mother. In 1684 EDMOND HALLEY convinced Newton to resume his work. Halley was the King’s official astronomer and one of many scientists close to discovering what Newton had known for years, that a force of gravitation controlled all planetary motion. Halley urged Newton into writing his theory, and in 1687, Newton produced what is still considered to be one of the greatest scientific books of all time, Mathematical Principles of Natural Philosophy, also known as the Principia. In it he laid out his three laws of motion, which were: 1. Every object remains at rest or in motion until it is compelled to change by a force acting on it (the law of inertia). 2. The motion of an object changes in proportion to and in the direction of the force acting on it (the law of force). 3. Every action has an equal opposing reaction (the law of action and reaction). Newton became interested in politics in the 1690s and was put in charge of the Royal Mint in 1696. In 1704 he finally published Optiks, which compiled all of his work in the field. In 1705 he was knighted by Queen Anne. 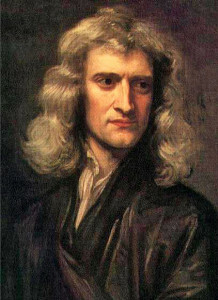 Newton died on March 20, 1727. While Newton’s contributions in optics, telescopy, and calculus were significant, his laws of motion were truly Earth­shaking. With one great stride, Newton codified all of planetary motion, which laid the groundwork for much of modern physics and changed the way the universe was viewed. Newton’s influence was immediate. He solved outstanding questions about planetary movement that other contemporary scientists, including Halley and Hooke, struggled with. Following the publication of the Principia, Newton’s followers immediately adopted his theories, which spread across Europe. The great influence of Newton’s laws of motion lies in the fact that they had universal application. They were used to explain the paths and speeds of planets and moons, eclipses and tides. The laws also enabled future astronomers to analyze all observations and calculations against a systematic understanding of how bodies in space move and operate. In the early years of the twentieth century, deviations in the predicted paths of Uranus and Neptune led astronomers at the Lowell Observatory in Flagstaff, Arizona, to look for and find the planet Pluto. Engineers have used Newton’s laws to correctly lay out the flight paths of probes sent to explore the far reaches of the solar system. Later in the twentieth century work in subatomic physics led to the realization that the movements of the smallest particles were controlled by a slightly different set of laws, called quantum mechanics. Together, classical (Newtonian) and quantum mechanics define on a macro and micro scale the movement and behavior of the largest objects and tiniest particles in the most vast and smallest of spaces.